A new manual provides a hands-on guide for all aspects of liquid treatment. 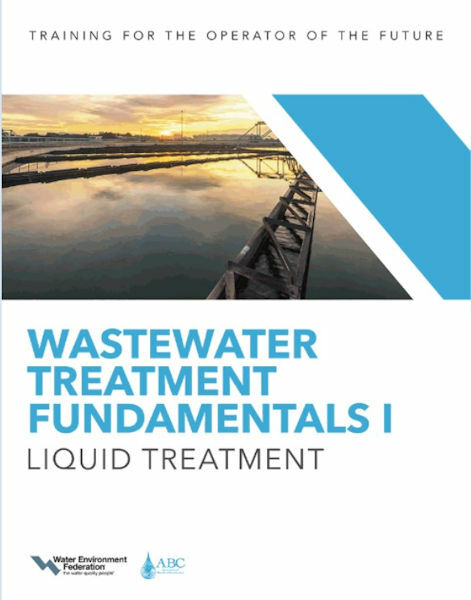 Wastewater Treatment Fundamentals I — Liquid Treatment can help operators prepare for the first three levels of certification exams. The Water Environment Federation (WEF; Alexandria, Va.) publication outlines all stages of wastewater treatment. It also describes critical aspects of biological treatment, nutrient removal, and disinfection. The peer-reviewed publication provides real-world examples of treatment to help users apply the information to their facilities. Designed to be a self-study resource, the publication incorporates detailed visuals and infographics as well as practice questions and example formulas. It aligns with updates from the Association of Boards of Certification (Ankeny, Iowa) “need-to-know” criteria and WEF’s other manuals of practice (MOPs), including the Operation of Water Resource Recovery Facilities, MOP 11. To earn Continuing Education Units, WEF also will offer a package that includes the print book, online course, and final exam. Add your name to a mailing list to be informed when this package is available.